Jim received his undergraduate degree in Biology and English Literature (Honors) from Binghamton University in upstate New York. He carried out his graduate work with Dr. Richard Myers in the Department of Genetics at Stanford University, where he contributed to the Human Genome Project and characterized the evolutionary history of protocadherin cluster genes in vertebrates. He received his Ph.D. in 2004. He did his postdoctoral work in Dr. Edward Rubin's lab at the Lawrence Berkeley National Laboratory and the U.S. Department of Energy Joint Genome Institute. At Berkeley, Jim developed methods to sequence and analyze ancient genomic DNA, providing the first insight into the Neanderthal genome. He also pioneered the discovery and analysis of uniquely human genetic changes that altered developmental gene regulation during human evolution. Jim joined the Yale Genetics faculty in 2007. He is currently Associate Professor (tenure) of Genetics, of Ecology and Evolutionary Biology, and of Neuroscience. He is also a member of the Kavli Institute for Neuroscience, the Yale Stem Cell Center, and Executive Director for Genome Sciences at the Yale Center for Genome Analysis. Rebecca is a physician-scientist with a special interest in autism spectrum disorders. She conducted work on the mechanistic basis of pediatric acute promelocytic leukemia (APL) and infection-induced preterm labor prior to joining the Medical Scientist Training Program at the Albert Einstein College of Medicine. There she completed her thesis with Dr. David Fidock examining the molecular genetic mechanisms of malaria var gene expression and pathogenesis. The development of molecular and genetic tools to elucidate the mechanisms of pediatric disease pathology was highly rewarding, and these experiences motivated her current research goals. On the clinical wards, she found the psychiatric care of children and adolescents to be very gratifying, particularly the impact of developmental disorders on physical and mental health. This contributed to her desire to better understand genetic factors contributing to ASD, and resulted in a review of the genetics of ASD with Isabelle Rapin, M.D., a pioneering figure in pediatric neurology. She entered the Solnit Integrated Adult and Child Psychiatry Research Training Program at the Yale University Child Study Center to simultaneously complete clinical training in adult and child psychiatry while also engaged in academic research. Martina is a physician scientist with a particular interest in autism and other neuropsychiatric disorders. During her medical training (Marburg University), she developed a mouse model of REM sleep behavior disorder, a precursor of Parkinson’s disease, at Harvard University. Fascinated by the possibility to study neuropsychiatric disorders at an early stage, she switched her focus to developmental neuroscience. Martina’s goal is to map the spatiotemporal expression and determine the function of autism risk genes (CHD8, CHD2, POGZ) during critical periods of cortical development using cellular and animal models. Martina is currently supported by the German Research Foundation (DFG). Severin is interested in species-specific adaptations with a focus on gene regulation as its cause. Studying gene regulatory innovation in human brain development, he uses a Massively Parallel Reporter Assay (MPRA) to query the effects of human-specific substitutions on regulatory function in human neural stem cells, the main proliferative cell type of the developing brain. He integrates the results with large scale genomic data that he analyzes with both traditional statistics and machine learning approaches. Severin did his undergraduate studies at the University of Heidelberg, Germany, and Uppsala University, Sweden, and earned a PhD in evolutionary genetics from Uppsala University in 2015. He joined the lab in 2016 and is supported by a fellowship from the German Research Council (DFG). Sara studied Biotechnology at the University of León in Spain. In 2011 she started her master at the University of Valencia in collaboration with the IVI fertility Clinic. Subsequently, she moved to Cologne, Germany to do her PhD under the supervision of Dr. Alvaro Rada Iglesias working on the functional characterization of poised enhancers and stayed there six months as a postdoc with a Köln Fortune Grant. Upon joining our lab in 2018, Sara started working with iPSCs lines from human and non human primates to develop an in vitro system to study regulatory elements using an EVO-DEVO approach. Evan’s interest in the brain and development goes back to his first college seminar course “Your Brain: A Work in Progress”. He studied biochemistry and molecular biology as an undergraduate at Allegheny College and later became involved in the genetics of neurodevelopment. His post-baccalaureate research contributed to the identification of genes associated with autism spectrum disorder in the lab of Gerard Schellenberg at the University of Pennsylvania. In the Noonan lab his research focuses on the characterization of human embryonic brain enhancers, which are regions of the genome that control when and where a gene is expressed. He utilizes a high-throughput genome editing approach to delete or ‘knock-out’ thousands of enhancer regions of the genome in parallel. The aim of his research is to identify a subset of critical enhancers that contribute to cortical development and evolution by modifying neural stem cell proliferation. Kristi joined the Noonan Lab in 2016. She is leveraging single-cell transcriptome analysis to study at high cellular and anatomical resolution how disruptions to specific genes during brain development play a role in autism spectrum disorder. As a part of this work, she has developed new approaches to effectively visualize and interpret single-cell expression data, helping to provide insight into complex biological systems across various disciplines and applications. Kristi completed her undergraduate studies at the University of California, Berkeley where she earned a degree in molecular and cell biology and minored in education. She is interested in data visualization, teaching biology and bioinformatics, and video games. Kristi is supported by the NSF Graduate Research Fellowship. Emily is interested in the genetics of species differences. 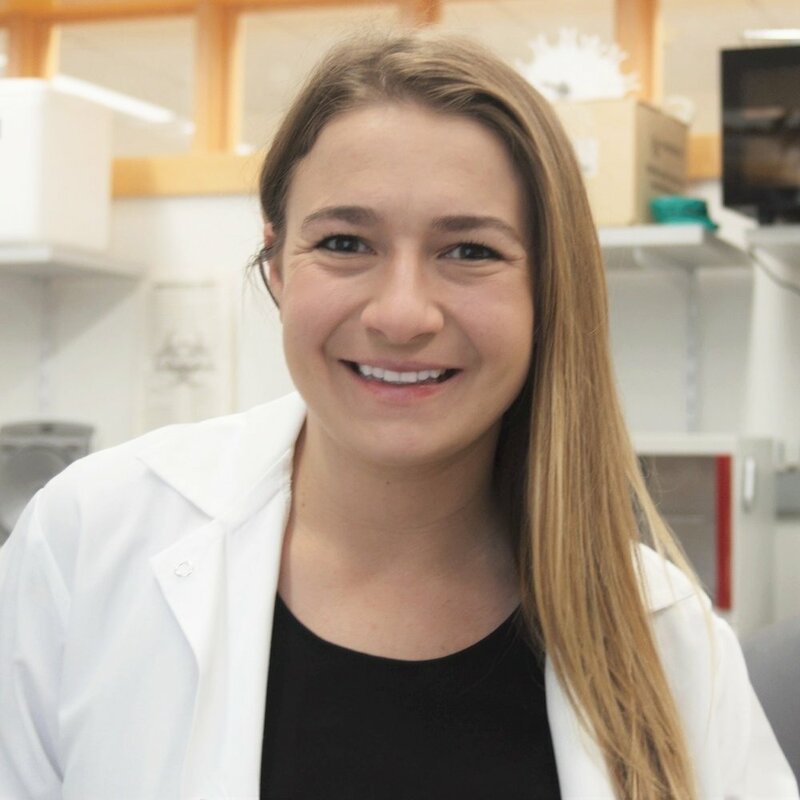 After studying biology at Haverford College with a focus on molecular biology and evolution, Emily joined the lab of Dr. Gustavo Aguirre at the University of Pennsylvania where she studied canine genetic diversity and the molecular pathogenesis of inherited retinal diseases. As a graduate student in the Noonan lab, Emily’s research focuses on the genetics of human biological uniqueness. She developed “humanized” mouse models using CRISPR-mediated interspecies sequence conversion to study regulatory elements that have gained a function on the human lineage. Using humanized mouse models, Emily is connecting human-specific sequence composition to uniquely human aspects of embryonic development. Acadia studied genetics and molecular biology at Northwestern University before joining the Noonan lab in 2016. She is interested in how changes in gene regulation can facilitate the evolution of species-specific features. She works with a humanized mouse model in which a region of the mouse genome has been replaced with its human counterpart, an enhancer active during brain development. Using this model, she aims to characterize aspects of embryonic development that are affected by humanization. Mark is a first year Ph.D. student in the Department of Genetics who joined the lab in 2018 after graduating from the University of South Florida in 2017. He is interested in human-specific regulatory divergence in the developing brain, and his project addresses the genetic and regulatory pathways that have been selected for through evolution that underlie the human expansion of the neocortex. María recently joined the lab after graduating as a Biologist in 2017 from the National Autonomous University of Mexico (UNAM), where she focused her research in Molecular Genetics and Biochemistry. At Noonan’s Lab, María is interested in understanding how changes in gene regulation can lead to autism spectrum disorder.